true gattuso offers no creative talent although he has become considerably better thru the years. he often makes mistakes and gets sent off. his defending has gone downhill. but the truth is that many teams would kill to have him in their squad just for the fact that is the type of player that is becoming extinct. the type of player that destroys plays. at one time or the other a team needs a player like that. take a look at real. there game sucked so much after makelele left. and look at makelele at chelsea. huge squad and makelele plays most of the games. we are lucky to have gattuso and we are lucky that ancelotti has found a place for him were he covers cafu's back and he helps pirlo defensively. oh and gattuso is the only player i have seen that is able to get the crowd rallied up even in times of despair. remember milan-inter CL 02/03 and against roma in san siro 04. milan was under pressure and gattuso just signelled to the crowd and the whole stadium exploded. they doesnt play in the same position. Well, I admire his honesty, if nothing else. He's like the Charles Barkley of Milan. LOL, has he made *that noise* again ? His little summer pastime of bitching just to kiss up to Ancelotti 5 days later is really getting old. F^ck that. GO already ! There's only 1 year difference, or 7 months if I'm too precise, between them. I don't think Rino's the man to be our captain. With all due respect to him but he hasn't got the right attributes a captain must possess and he's has a tendancy to make stupid statements like the one he made yesterday. A captain's personality must be a lot more serene and calm during the game, which is completely the opposite to him. I just can't imagine that after Baresi and Paolo comes Rino, it just doesn't fit. 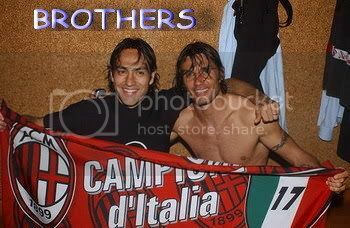 For me the two men to carry Paolo's badge are either Max or Sheva. Pressure at a top club, oh noes!!!! Just go and stop bleating about it all the time. why on earth did he said that? don't he think about milanisti that loves him? that enjoy to watch him? i love to see gattuso to play. but if he said that he wanted to leave milan, go ahead. milan is a club that respect its players. since gattuso don't show respect, just let him go. Forever and ever, I am a Milanisti. istanbul. if i was a milan player that played that day i would of surely shot myself already. i think that is the type of pressure he is talking about. Thats why he shouldnt be captain. Captain should take the responsibility and the pressure that lies on the team,and player like gattuso should never get the armband. How can a player predicted to be a captain talks like this?its a bad bad idea if he takes the armband. How long Gattusso plays for Milan? 3 - 4 seasons or something like that and now the pressure is too high for him at Milan? I agree with you 100%, Pirlo is already a great captain. I saw him in the olympics with the Azzurri and he was inspirational. He was also unlucky not to get a gold medal I thought. Cafu is also an option, what he has done for Brazil is reason enough. I agree with you 100%, Pirlo is already a great captain. I saw him in the olympics with the Azzurri and he was inspirational. He was also unlucky not to get a gold medal I thought. He proved it at U-21 level. Cafu is also an option, what he has done for Brazil is reason enough. But he's not been long enough in Milan to be it's capitano. Another option would be Max, or Sheva. Your right about Cafu, but I still think he would do great at the job. I'm not sure about this, but I think one of the conditions of choosing a captain is chosing one who has been with the team longer than the rest. That's why when Capitano's not there, usually Billy, Max or Sheva take the badge. I wouldn't mind giving it to Pirlo or Cafu, but I don't think it'll happen.